your affectionate Husband until Death. I have some money for you but have no chance to get it to you. Farewell for this time. 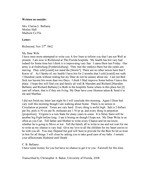 Written on outside: Mrs. Clarisa L. Bellamy Mosley Hall Madison Co Fla Letter: Richmond, Nov 27th 1862 My Dear Wife I have once more attempted to write you A few lines to inform you that I am not Well at present. I am now in Richmond at The Flor ida hospittle. My health has bin vary bad indeed for Some time but I think it is improvei ng vary fast. I came Here last Friday. Our army is at fredricburg [Fredericksburg]. They met the yankeys there but the yanks are leaving. They cold [could] not stand the [S torm?]. There are no other newes here that I Know of. As I Spoke of, my health I have bin for 2 months that I cold [could] not walk 3 Hundred yards without resting but my Dear do not be uneasy about me. I am not Bed Sick nor havent bin more than two Days. I th ink I Shal improve Some before I leave this place. I hope this will find you and family all well & Marsden and Richard [Marsden Bellamy and Richard Bellamy] is Both in the hospittle Some whare in this place but [I] cant tell whare, that is if they are living. My Dear have your likeness taken & Send it to me and Marthas. I did not finish my letter last night So I w ill conclude this morning. Again I Dont feel vary well this morning though I am walking about Some. There is no newes in Circulation at present. Times are vary hard. Every thing is awful high. Salt is 2 dollars per lbs, pork is 50 cts per lb, molasses are 1.50 pr qt, and every thing in perpotion [proportion]. Virginia is a ruin State for many years to come. It is likley there will be another big Fight before long. I see it bruing on though I hope not My Dear Write to as ofton as you Can. Tell father and Mother to write every Chance and let me know whether he is going to Move or not. Tell the family all to write to me and not wait for me to write as my chance is vary bad. Give my lo ve to all the children for my heart craves to be with you all. You may Depend but god will Sure to provide for the Best So let us trust in him for all things. I will close by asking you to take good care of my baby. I remain your affectionate Husband until Death. C. B. Bellamy I have some money for you but have no chance to get it to you. Farewell for this time. Transcribed by Christopher A. Bake r, University of Florida, 2008.